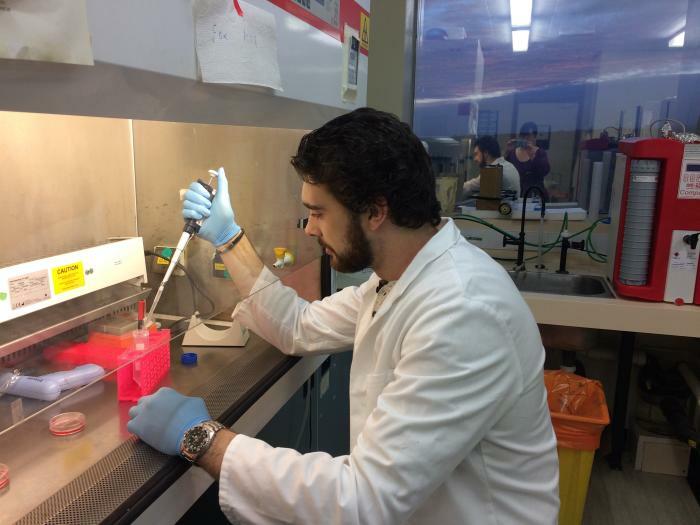 Thomas Kennelly is a PhD student working with me in collaboration with Professor Eva Qwarnstrom in the Department of Infection, Immunity, and Cardiovascular Disease. He is primarily interested in measuring the strength of interaction between cell surface receptors and their ligands with relevance to the regulation of the innate immune system or the inflammatory response. What this all means is that it will help us to understand better how the strength of binding affects the strength of inflammation. The project mainly incorporates the use of an atomic force microscope to measure the relevant single molecule interactions he is looking for. Originally from Bolton, he moved to Sheffield to study an MPhys. he did a summer project with Matt Mears on sperm, which convinced him that the boundary between physics and biology is great and the more research in the area he could do, the better. Hence he applied to do a PhD with me. He was awarded a Departmental scholarship, which means he also gets experience of teaching, which is always good, and also of marking, which isn’t. He started his PhD in 2013 and quickly won a Departmental scholarship to spend the following summer in China, where he had the opportunity to work in Yi Cao's lab at Nanjing University. Travel to far flung places became very appealing and in 2015 he and spent a month working for an environmental organisation which involved diving on the coral reef off a small remote island in Indonesia. PhD students have a tough life. Nevertheless, Tom has deserved it. The photo shows him working hard in the Medical School, where he can’t even find the time to smile for the camera. On Friday July 20, 2018 Tom successfully defended his thesis in front of his examiners, Dr Lorna Dougan (University of Leeds) and Professor Paul Hatton of our Dental School.